Sarah Jeong and the Media War Against America – ITEL – 8.4.18 | Inside the Eye - Live! 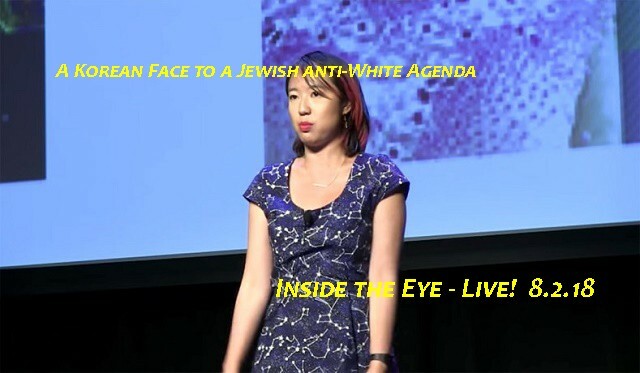 Sarah Jeong, the virulently anti-White racist who this past week was promoted to the New York Times editorial board, provided the main focus for Inside the Eye – Live! on Saturday, August 4th, 2018. Sarah Jeong’s promotion puts on a Korean female face to what is a very real Jewish war against White American and Western Civilization at large. The hiring of Sarah Jeong lit up the media across the spectrum: MSM, alternative media, and social media all buzzed about how the Jewish owned New York Times could hire a person who exhibited such clear and obvious hatred of most Americans. We posit that Sarah Jeong was hired PRECISELY because she hates Americans: so too, it seems, does the greater body of Jewish political power structures in the United States. Social media, itself, is but an extension of this Jewish war on White Americans and is being consistently used to destroy people’s careers and opportunities. Jews have created an environment where “free speech” really means “self censor” lest you find you career and your life derailed under the weight of Jewish constructed indignation. To Jews, the opportunity to label anyone an “antisemite” is supposed to carry with it a complete destruction of a person’s life. Witch hunts are waged against White Americans who seek to express their political interests. The campaign waged after Charlotte’s Unite the Right Rally was a discussed case in point. Some good rants about social media and its censorship of conservative voices, the White hating Sarah Jeong’s hiring, and much more.